How true! I’ve been thinking about this on and off and a small episode came into my head about Christmas at Hall Garth when I was a child which illustrates this nicely. I am eight years old and live at Hall Garth, a large country house in Co. Durham, with my parents and my three brothers (an heir and two spares: ‘You’ve done very well, my dear Joan,’ my grand-mother told my mother, condescendingly), a nanny, a nursery-maid, a cook, a butler, a groom who looks after my father’s hunters, a gardener whose wife does the heavy cleaning, helped by Mrs Speirs from the village, and old Mrs Tulloch, (who came from the Shetlands and tells stories of her childhood there) who comes in weekly to do the mending. My Aunt Polly and her two sons usually join us for Christmas. Roland and Piers are two-and-a-half and five years older than me and call each other ‘Bros’ which I find incredibly grown up, though, in fact, it’s just prep school slang. Carr, the butler, does the Christmas decorations in my parents’ part of the house: morning-room, dining-room, drawing-room and the two halls, but ignores the smoking-room, my father’s domain. 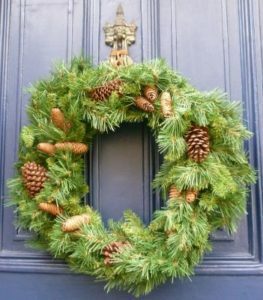 He arranges artistic sprays of holly along all the large gilt picture frames with tasteful blobs of cotton wool for snow. The Christmas tree is up in the nursery and smells wonderfully piny. We still use the Victorian metal candle-holders with real candles which you clip onto the branches. When lit, they flicker beautifully. There are fragile Victorian glass baubles, too, which gradually break. Most exciting of all, Roland organizes games of ‘Battle Royal’. We upend the nursery furniture for barricades, share out the soft toys and hurl them at each other, never mind the bruises. Every now and then, Roland calls a truce to collect the toys in No Man’s Land. Heaven knows how we don’t burn the place down – though there is a bucket of sand by the tree in case of accidents. On Christmas Eve, we hang up stockings at the end of our beds using my father’s knee-high woolly shooting socks (knitted by Mrs Tulloch). The turkey for so many people is so huge it has to be cooked in the large 19th century oven built into the four feet thick wall in the Elizabethan part of the house. At eight, I am still eating upstairs with Nanny, the nursery-maid and my brothers in the day nursery, so I don’t get to see the turkey in all its glory nor the flaming Christmas pudding. We get our share of turkey, stuffing and the rest, but our lunch is brought up separately by the nursery maid. I am not considered old enough to eat in the dining-room downstairs, and shan’t be until I’m eleven. I don’t suppose such a Christmas would have been out of place in the 1870s and, up in Country Durham at least, that way of life survived, more or less, until the mid-1970s. 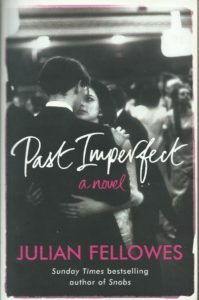 And, going back to Julian Fellowes’ comments about time, the world of my eight-year-old self was so different from the world today in its customs, social assumptions, language and ways of thinking, I can scarcely believe that it really was like that. But it was. Completely fascinating. So very different. When did things start to change for your family? Things changed for my family when the family Iron and Steel business collapsed in 1976 and Hall Garth was sold. Things changed for me when I went to Paris to be ‘finished’ (!) and they have changed a number of times since – as I guess things have for most of us. Thanks for posting this glimpse into a different world, Elizabeth. When I was eight I lived in my grandfather’s two up, two down terraced house in a Lancashire cotton town. Not at all like your experience but a working class way of life that has vanished like your childhood’s. We didn’t even have a bathroom, a tin bath hung on an outside wall and the toilet was across the flagged yard. My children, who grew up living in Hertfordshire in much more affluent circumstances, look at me as if I am talking in Double Dutch if I mention anything about those times. Thank you for your interesting contribution, Gail. We, too, had a tin bath, an outside loo, and a pump with a handle which gushed out water in the yard outside the kitchen. I hope you had your bath in front of a fire! I suppose most old houses have a few relics of their pasts without modern conveniences. My primary boarding school in Upper Teesdale had no electricity! We has hissing a Tilley lamp hanging on a hook from the ceiling in the schoolroom, otherwise it was paraffin lamps. The cooking was by calor gas. There were open coal fires downstairs. In the dormitories upstairs it was so cold in winter that the windows frequently frosted over. It’s all relatively recent, yet it’s hard to imagine how those born into the age of the internet, wifi, and constant communication via mobile phone could comprehend such a world. I agree, Prem. We did have a telephone – just the one. And, of course, the post was much more frequent with four posts a day. But we played outside a lot in the woods and by the moat – which we all fell into regularly – it’s a wonder we survived. This is so evocative, Elizabeth. What happened to Hall Garth? How long had your family lived there? Thank you for your comment, Catriona. 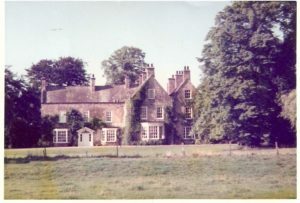 Hall Garth is now a Country House Hotel and Conference Centre. The family arrived there in about 1904, so not that long, really, but long enough for the attics to be full of stuff like old paraffin lamps, warming pans, stone hot water bottles, a linen press, old irons, carpet sweepers and so on when we left. My grandfather had central heating put in in the 1920s but, before that, it must have been pretty nippy in winter, even though all the windows had wooden inside shutters and the curtains were warmly lined. Tilley lamps, paraffin lamps and servants is so evocative for me. At 8 I was living the colonial life in Africa. We weren’t separated for meals but I recall parties when we were very young from which we were excluded, but we still managed to sneak in. But domestic chores have always been a trial to me not having grown up doing them. I’m absolutely with you about domestic chores, Elizabeth. What a wonderful picture you’ve pained of a not-that-long-ago era! I can relate to much of that except I would see it from the servants point of view. Most of my 1940s/1950s childhood was spent living in other people’s houses while my parents worked in domestic service, my mother as cook-housekeeper, my father as chauffeur/gardener. Except we didn’t live in such a grand house! Thank you for your interesting contribution, Anne. I have to tell you that, for me, the downstairs world in the kitchen with Carr and Mrs Smith was far, far more interesting than the upstairs world. We saw our mother for an hour in the evening 5 to 6 pm. Nanny brought us down – all tidied up – knocked on the morning-room door and said, ‘The children, Madam.’ We were ushered in, on our best behaviour, and sat on the sofa. My mother read to us. At 6 o’clock, Nanny came back and we kissed our mother goodnight and went back to the nursery. The kitchen was a far more lively place and I sneaked down there whenever I could.